My new comic is live! 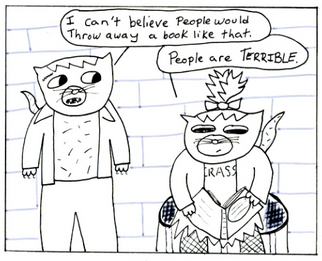 Cats In The Alley (written by my friend Nicolle, and drawn by me) debuted last night during the Superbowl. If you were too busy looking at the power outage, you can still read it, because the internet is forever. You can also like us on Facebook, or follow us on Tumblr. Here is a panel from the first one that we are going to make into bookplates. Instead of “this book belongs to” they will say “this book was not thrown away by _______”). Just try to act like you don’t want these! New episode Sundays and Thursdays. You can add them to your RSS reader if you’d like to keep up.